'Owned media' can drive 'Earned media' / conversation and over recent months I have highlighted a number of cases where brands are using ads and other assets to promote their social presences and drive conversation. Every asset has the potential to be used to drive fans / followers, providing opportunities for future dialogue. However, using an asset like a boarding card is different to using an asset like a broadcast ad. Instead of targeting the mass or anyone who has a passing interest, this is about targeting people who are already customers. The action of printing off a boarding card shows that you are already a customer, thus the audience has already been qualified and only those who have a made a purchase see the message. Twitter in this context therefore becomes a loyalty tool, a way of furthering conversation with those who have already engaged with the brand. The fact that this message is not displayed on the printed pass adds an element of exclusivity to the invitation, though it also potentially reduces the effectiveness of the CTA - at that moment in time you are only thinking of printing off the boarding pass! Interesting way of integrating Twitter into a core product though. Good spot and interesting post. Adding to it brands should start to think about how they want to use Twitter. "Follow us on Twitter" is very broad and needs clarity, why do I want to follow an airline? What are they using Twitter for? I'm sure clarity would make it more useful for their customers. I.e. is it a customer service channel as in the case with Best Buy? Or a news channel? Or just a friendly "let us know your thoughts" type channel. 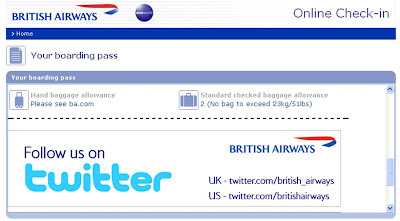 BA and other companies put their Twitter address at the bottom of their assets like a snail mail address. It's the same as saying write to us. But no reason is given. It would be better if it said "Got a question? Ask it on Twitter" or "Going somewhere nice? Let us know on Twitter" or "Keep up to date with our latest offers on Twitter". It's great BA have this and are promoting it on their onwed channels (they've got almost 19k followers), I'm just sure a bit more focus would make their Twitter channel even more beneficial to both flyers and BA. That's a great spot! I've noticed twitter handles be added to direct mail shots as well recently. For me, one of the interesting challenges facing brands is how to not only form digital connections with their online customers, but map these back to their existing customer database. We are working with one brand to do this - build up social network connections with customers who have currently only supplied their postal address. V important for future-proofing, as well as cutting out the P&D cost of campaigns. I have been commenting quite a bit on people adding Facebook / Twitter addresses to display ads instead of listing their web page. Have also started seeing retail outlets adding POS messages about their social presences and think it makes sense to use every asset to promote social spaces. I liked the BA initiative because it's promoting the feed to existing customers rather than just anybody. As for usage strategy - I don't think anyone really knows for sure what will happen. I have a suspicion that customers will want different things from different companies (news vs offers, exclusive content vs general info etc) - but I don't think customers / general customers have yet fully worked out how they can use Twitter to engage brands either. There is an element of see what happens, but being there and available is the main thing for now - and using 'owned' media to promote these things is a clever approach.